Forest Avenue Press, 9781942436355, 368pp. When John Nelson abandoned his government job to join a scrappy band of activists, he didn't realize trying to save the world would be so hard. His ideals remain strong, but his optimism is wearing thin. His fellow activists--computer hacker Jen Owens and Vietnam vet Irving Fetzer--still think he's a square. And their radio show can't compete with the corporate media. 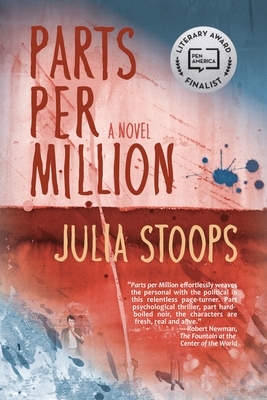 Parts per Million, Julia Stoops's socially conscious, fast-paced debut novel, is set in Portland, Oregon, in 2002. As the trio dives into anti-war protests and investigates fraud at an elite university, Nelson falls in love with an unlikely houseguest, Deirdre, a photographer from Ireland--and a recovering addict. Fetzer recognizes her condition but keeps it secret, setting off a page-turning chain of events that threatens to destroy the activists' friendship even as they're trying to hold the world together, one radio show at a time. Julia Stoops was born in Samoa to New Zealand parents, and grew up in Japan, Australia, and New Zealand. She moved to Washington, D.C. in her teens, where she received a BFA from the Corcoran College of Art and Design. Back in New Zealand, Julia studied Philosophy and Linguistics at the University of Auckland, where she received a BA. She endured New Zealand's Rogernomics recession of the early '90s, and finally got her first real break teaching in tertiary level art and design programs. Because of her Corcoran experience, Julia wanted to return to the US. She and her husband chose Portland, Oregon as their immigration destination, and have lived there since 1994. Julia received an MFA in Painting from Portland State University, and taught for 13 years at the Pacific Northwest College of Art, creating new courses in media studies, hybrid art methodologies, and the history of ideas. Then she moved into her current career as a web designer, and she also has experience in alternative radio news journalism and anti-war activism. Julia received Oregon Arts Commission fellowships for visual arts and literature, and was a resident at the Ucross Foundation in 2016.